Val Fawbert is a Brighton-based palette knife artist. Using acrylic paint, she creates modern impressions on deep edged canvases. Val works from her City Retreat studio in Hove and takes inspiration from the surrounding city, seaside and coastline. 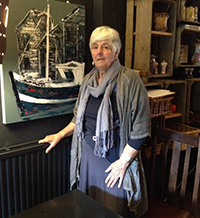 About the artist: Val Fawbert is a retired teacher who studied art education at the universities of Sussex and Brighton. Her early influences include sculptor Jenny Hughes and printer and art lecturer Toni Patten. Hove based and Brighton born, Val aims to capture the essence of this vibrant city in her urban and sea scenes. Working in acrylics from her city retreat walled garden studio in Hove, Val produces stunning and unique images on canvas. Her technique combines the texture of canvas with acrylics and the skimming and scraping movement of the palette knife, resulting in contemporary and original works that project energy, movement and light. Spatial awareness and economy of colour are also crucial components of her compositions.